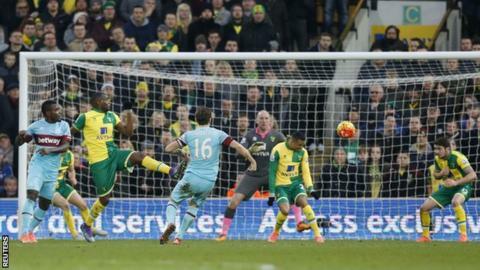 Norwich blew a two-goal lead but ended a run of five league defeats with a draw against West Ham. Robbie Brady robbed Michail Antonio of the ball and curled in a shot before Wes Hoolahan drove in a close range effort to put the home side 2-0 up. But Dimitri Payet slotted in for the Hammers after Victor Moses had a shot parried into his path. Payet then pulled the ball back for Mark Noble to steer in a shot and complete West Ham's comeback. Hammers substitute Emmanuel Emenike had a great chance late on when he got on the end of an Andy Carroll flick on but he trapped the ball instead of diverting it towards goal and allowed keeper John Ruddy to gather. In a frantic finale, Nathan Redmond had a shot blocked by keeper Adrian, while a Norwich corner was also cleared from the Hammers goalmouth. Norwich were 3-1 up against Liverpool recently but contrived to lose 5-4 and they were at it again when it came to throwing away points from a winning position. At 2-0 up, they should have been easing to victory against a West Ham side that had suffered key injuries having been taken to extra-time in a midweek FA Cup replay win over Liverpool. However, when they needed cool heads, the home side capitulated as they lost their organisation and discipline. While the nature of the draw may feel like a defeat for the Canaries, they moved up one place and out of the relegation zone on goal difference following Newcastle's 5-1 thrashing by Chelsea in the later kick-off. "It is the same old story," said Brady. "We can't let teams back into the game when we have a two-goal lead." West Ham improved with the introduction of winger Victor Moses, whose powerful run forward and parried shot led to his side pulling a goal back. The goal breathed new life into the Hammers and, with Payet starting to have more of an influence, they finished the game stronger and equalised through Noble. "We were just thinking about getting the next goal [when we were 2-0 down]," said Noble. "They have had a tough time here at Norwich and we knew if we could get the goal it would be hard for them." Both league games between the two sides this season have now finished 2-2 and, while West Ham salvaged a point, they dropped a place to seventh in the Premier League after being overtaken by Southampton. Norwich manager Alex Neil: "We created good opportunities and it was a better performance than we have had recently. But from 2-0 up at home and with the way the game was going we should have seen it out. West Ham boss Slaven Bilic: "We are never happy with a point, we are not buzzing. But when that point comes after being 2-0 down it gives us confidence and satisfaction. "After Tuesday night (the FA Cup fourth-round replay against Liverpool) when we played 120 minutes, to show that kind of strength, resilience, character and quality makes us happy." Former Norwich striker Chris Sutton said he felt his ex-club would go down if they did not get a win against West Ham. He added: "I just think if you look at Liverpool when they were 3-1 up and lose, two goals up today, this will do Norwich so much damage psychologically." West Ham have won just one of their last nine Premier League away matches (won one, drew four, lost four). Norwich have won none of their last six Premier League games conceding at least twice in each of those games. Norwich have conceded 50 Premier League goals this season - a joint-high alongside Sunderland. Dimitri Payet has scored or assisted 12 Premier League goals this season - twice as many as any other West Ham player. Both of Robbie Brady's Premier League goals for Norwich have been against West Ham. West Ham boss Slaven Bilic is keen for his side to go all out in the FA Cup and their next game sees the Hammers face a trip to Blackburn on Sunday, 21 February (14:00 GMT) in the fifth round of the competition. Norwich are not in action until Saturday, 27 February, when they visit Leicester in a 15:00 GMT kick-off. Match ends, Norwich City 2, West Ham United 2. Second Half ends, Norwich City 2, West Ham United 2. Attempt blocked. Sebastien Bassong (Norwich City) left footed shot from the centre of the box is blocked. Assisted by Robbie Brady with a cross. Corner, Norwich City. Conceded by Pedro Obiang. Attempt blocked. Nathan Redmond (Norwich City) right footed shot from the centre of the box is blocked. Assisted by Gary O'Neil. Attempt saved. Russell Martin (Norwich City) right footed shot from a difficult angle on the right is saved in the centre of the goal. Assisted by Graham Dorrans. Corner, West Ham United. Conceded by Sebastien Bassong. Attempt saved. Dimitri Payet (West Ham United) right footed shot from outside the box is saved in the top left corner. Victor Moses (West Ham United) wins a free kick in the attacking half. Attempt missed. Emmanuel Emenike (West Ham United) right footed shot from the centre of the box is just a bit too high. Assisted by Andy Carroll with a headed pass following a set piece situation. Substitution, Norwich City. Graham Dorrans replaces Wes Hoolahan. Substitution, Norwich City. Dieumerci Mbokani replaces Cameron Jerome. Attempt missed. Victor Moses (West Ham United) right footed shot from outside the box is too high. Assisted by Mark Noble. Attempt missed. Robbie Brady (Norwich City) left footed shot from outside the box is high and wide to the right from a direct free kick. Goal! Norwich City 2, West Ham United 2. Mark Noble (West Ham United) right footed shot from outside the box to the top right corner. Assisted by Dimitri Payet. Substitution, Norwich City. Martin Olsson replaces Steven Naismith. Goal! Norwich City 2, West Ham United 1. Dimitri Payet (West Ham United) right footed shot from the centre of the box to the bottom right corner. Attempt saved. Victor Moses (West Ham United) right footed shot from the left side of the box is saved in the centre of the goal. Offside, Norwich City. Jonny Howson tries a through ball, but Cameron Jerome is caught offside. Attempt saved. Michail Antonio (West Ham United) left footed shot from the centre of the box is saved in the bottom right corner. Offside, West Ham United. Angelo Ogbonna tries a through ball, but Michail Antonio is caught offside. Goal! Norwich City 2, West Ham United 0. Wes Hoolahan (Norwich City) right footed shot from the centre of the box to the bottom left corner. Attempt blocked. Steven Naismith (Norwich City) right footed shot from outside the box is blocked. Assisted by Wes Hoolahan. Offside, West Ham United. Dimitri Payet tries a through ball, but Michail Antonio is caught offside.